I am SO excited today to share with you today a FANTASTIC new resource for English- and Spanish-speaking families with young children. ReadyRosie is a new online school readiness curriculum that shows parents how to work with their children up to 4 years of age to prepare them for Kindergarten and beyond. 3) Learn and grow with your child! The research-based curriculum focuses on the following areas: Problem Solving/Math, Foundations of Literacy in English or Spanish, Essential Life Skills, and Words, Words and More Words (Vocabulary). First, I love how different people are the focus of each video, making it real and showing how any family can implement the simple activities. I also appreciate the diversity and the inclusion of multicultural families. Second, ALL of the activity videos so far are available in English AND Spanish. If you are bilingual, you can watch both. I did. And I also think it is a plus to see how different people teach differently. I appreciate that different settings are used to reflect real-life situations. 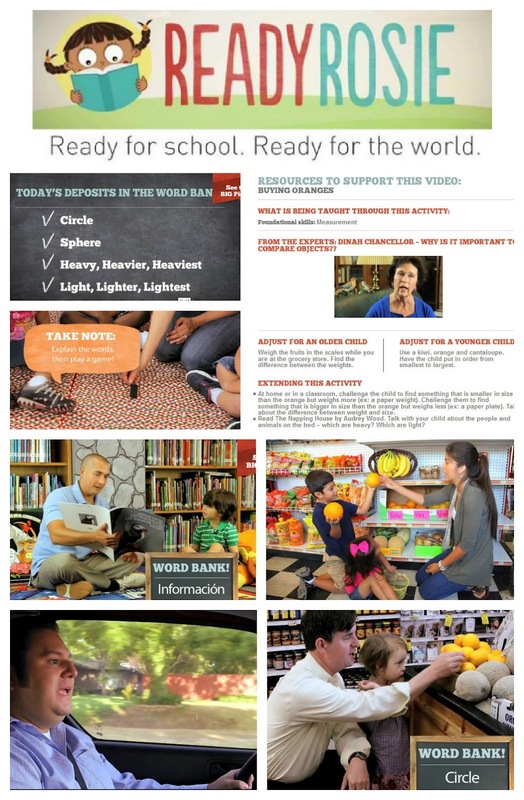 Activities for home, classroom, in the car, and even the grocery store have been created. Each video focuses on specific terms/vocabulary and highlights them in a little word box for parents. At the end of each video, the new vocabulary for the activity is highlighted in a word bank. And I like how additional tips appear in little bubbles on the video to point out specific techniques and ideas to parents. Also, each video comes with additional supplemental resources that include an Ask the Expert video, ideas for adjusting the activity for older or younger children, and how to extend the activity (book suggestions, additional activities that teach the same concepts, etc.). The only drawback right now is that at this time, they are not selling to individual families. Emily Roden, one of the founders of ReadyRosie, says "Our hope is that districts and non profits, etc. will purchase ReadyRosie subscriptions for their entire community so that it will be FREE for families!" Personally, I think they would get more subscribers by offering the subscription to individual parents who may not know who to contact in their school district. BUT I also think this is a great way to get a free service to families who are financially strapped and need it most. If you are interested in gaining access to ReadyRosie, I encourage you to contact them and find out what you can work out. I am so glad. I am thrilled to see the bilingual and full immersion school readiness programs. My boys have not shown much concern in learning a second language as of yet, but my daughter is really, really interested in learning Spanish. Thank you so much ReadyRosie. It is very inspiring and helpful to learn about your work. Please check out @hitn_elc for the bilingual storybooks that we are making available for 3- and 4-year-olds at our web site. www.earlylearningcollaborative.org They are part of a transmedia project funded by the U.S. Department of Education Ready to Learn grant and we need to let people know about these resources. They are FREE. Please let others know. I'm certainly going to sharing your incredible Mommy Maestra resource.